After the time has passed come back and click the exclamation mark above your sims head to find one of the cat show rosette collectibles. Every time your sims enters the cat show their cat show hobby level up percentage will increase, once you reach 100% you will level up, there are 6 levels. 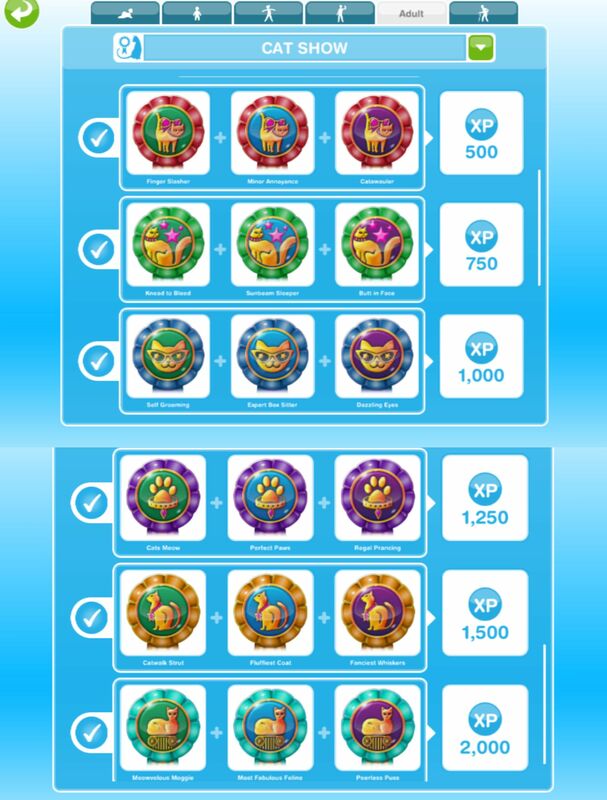 You need to reach level 6 to be able to unlock all of the cat show rosette collectibles, once unlocked you will be able to find them. Catwalk Hero Meowveleous Moggie, Most Fabulous Feline and Peerless Puss are now unlocked in the hobby collection. I have a different question, sorry for the english, im asian, how can you wear your sims with different underwear? Where can i have a chopping board? Complete the cooking hobby and you will find them in the kitchen section. I was having a problem buying a cat collar – I would buy one, the simoleans would disappear from my bank, but the collar didn’t show up on my cat. I didn’t contact EA myself but the “fix” was to save your game data to the cloud, delete the Sims Freeplay app, re-install it, and load up the game data. At least one person here said this didn’t solve the problem for them. I recently got a hand-me-down iPad — newer than my old one. Yay! So the hand-me-down was reset to factory settings, I got it as if brand new, I didn’t restore anything on it, I just treated it as new. So I installed a new copy of Sims Freeplay, loaded up my old game data, and: Success! 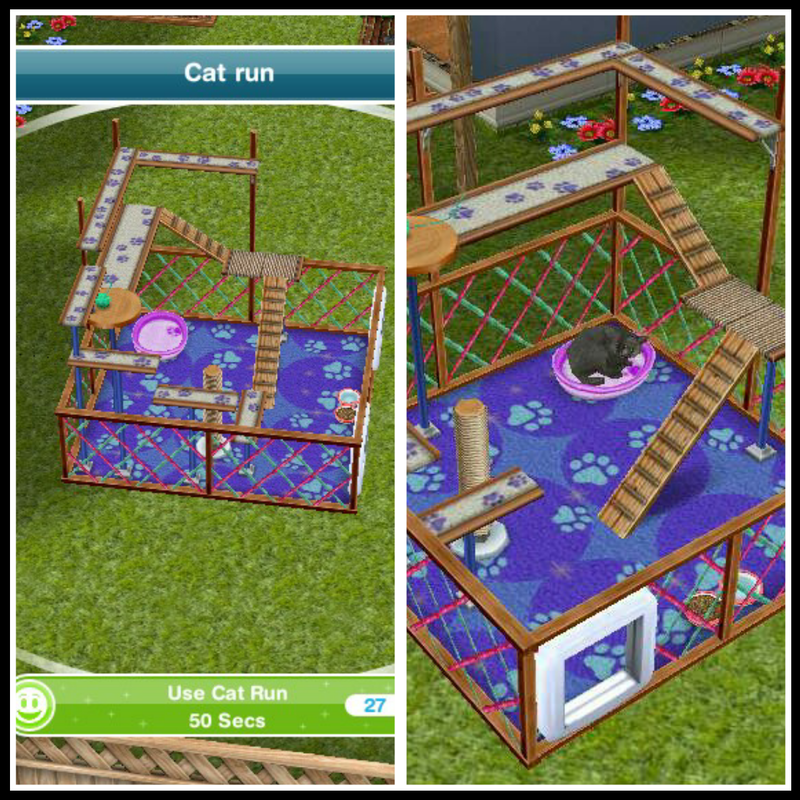 I now have a cat and a Sim doing the cat hobby. FWIW. You know what stinks? All of the sims I wasted to get the life orbs to build the pet park and the cat show area and now I finally am able to do the hobby and it’s taking for freaking ever to finish it. Blah. This game drives me nuts but I’m addicted to it. Is there a self help group out there? P.S. I’m so frustrated I forgot to say thank you for all of your help on all of these quests and hobbies and events! You do a superb job with this and I am so grateful for your hard work. Glad you like the game even though some of the hobbies take a rather long time! What are the dimensions on the cat play area? Also for the dog agility stuff and the dog slide for the pool? Can the cat play area and dog agility stuff go inside?